Attach the Safe-T-Stepper to the t-post. Make sure the post is securely installed and steady enough to hold your weight. 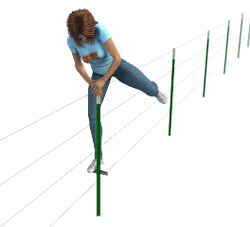 If the post is shakey, move down the fence line and try a different post. A properly attached stepper. 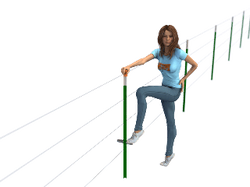 The groove on the bottom of the step should be fully seated on the tab of the fence post. 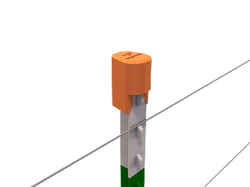 Attach the Safe-T-Cap to the top of the t-post. Occasionally the top of the post will be smashed or deformed too badly for the cap to fit. In this case, move down the fence line and try a different post. Place one foot on the step and step up. Swing your leg over the fence. Place your foot on the other side of the step. 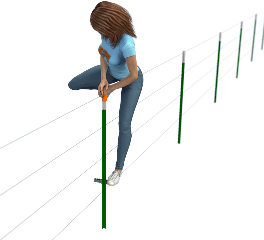 Swing your other leg over the fence. And step down to the ground.